This is the second installment in a series of my recent trip to Manila, Philippines. 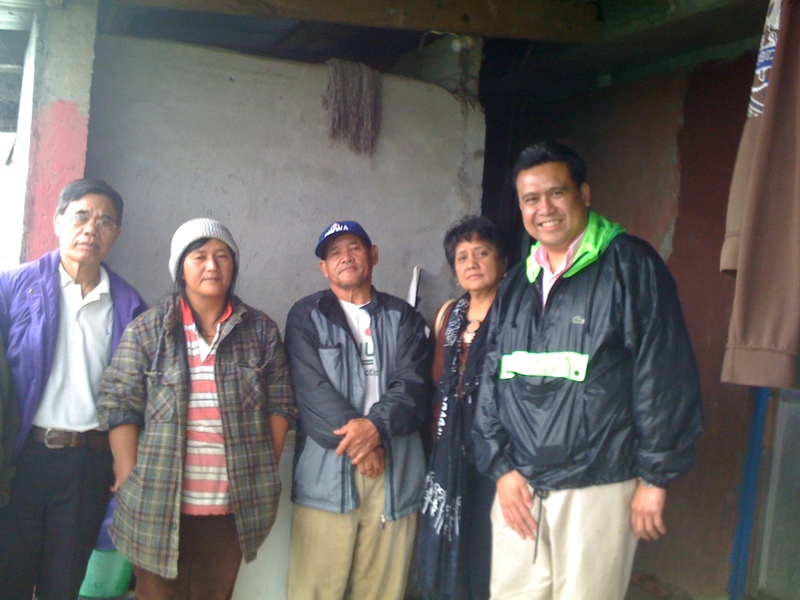 On January 15, 2011, I traveled From Iligan City in the south to Buguias, Benguet in the north. 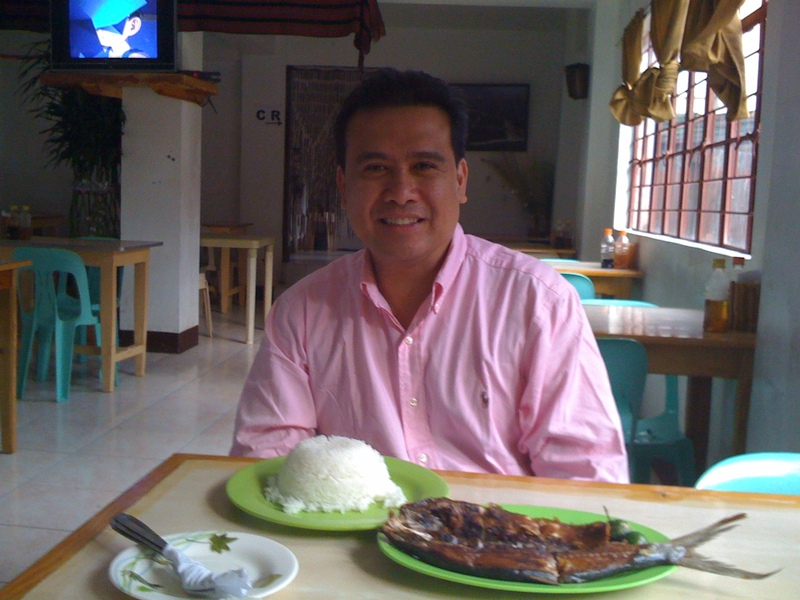 I had a traditional Filipino breakfast of fried fish and rice to fortify myself for the long nine-hour bus ride from the capital, Manila. Dale having a power breakfast with fried fish and rice, yum! 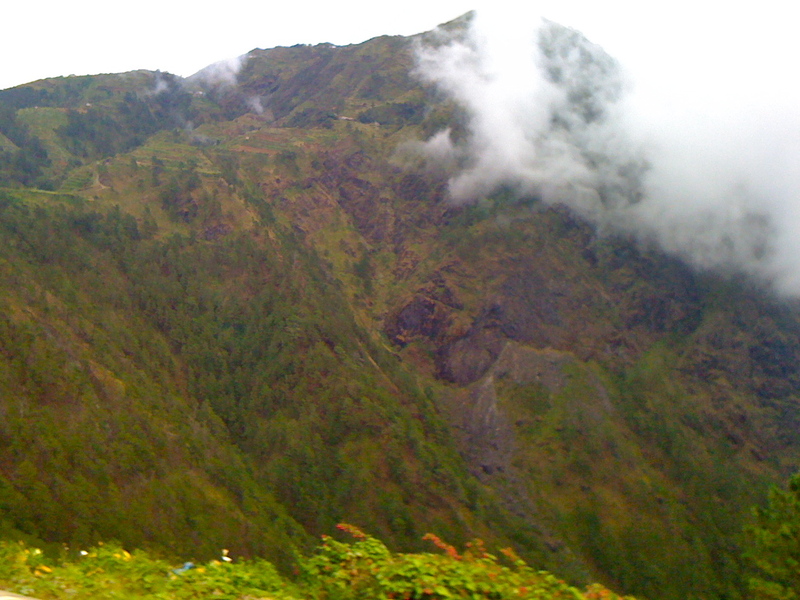 Why travel to Buguias, Benguet? I traveled there to meet with the foundation’s homeland partners who were introduced to me through our diaspora partners in Tel Aviv, Israel, halfway around the world. Many of our diaspora partners in Tel Aviv hail from this town nestled on top of the Cordillera mountains which top around 10,000 feet above sea level. It felt that the mountains were almost touching the sky. Myrla and I met with Mr. Sixto Cubangan; he is the father of Daisy Beth Cubangan, one of the Filipina community leaders in Tel Aviv, Israel. Sixto and the other elders shared with us their plans to have wheelchairs, walkers and canes to help the elderly and the invalid in their town. Many of them do not have these basic equipment; so many are immobile and isolated at their homes. 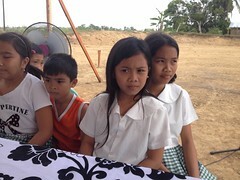 Daisy Beth and the other Filipino community leaders in Tel Aviv are planning to support this project. They are currently conducting a raffle draw to raise funds to buy the wheelchairs and other medical equipment. The foundation’s diaspora donors from Israel brought me to this spectacular mountain town. This visit significant for me as I realized how Filipino workers are so spread out all the world. I cannot help but reflect on Daisy Beth and her situation as a Filipina caregiver working in Tel Aviv. She came from a green mountain valley with cliffs carved into terraces and planted with vegetables and rice which is a contrast to the dry and desert landscape of Israel. I’m sure Daisy Beth misses her family. But she could not go home since she has to finish her work contract in Tel Aviv and perhaps she also could not afford the trip going home. I hope that Daisy Beth feels that she traveled with me vicariously and that I bring her closer to home. 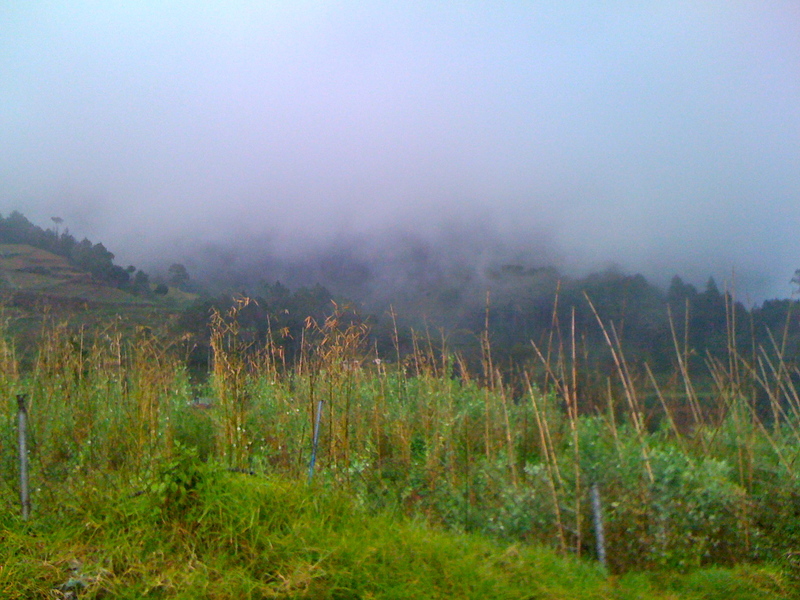 Heavy fog suddenly covered the entire Loo valley by the time I finished my meeting with the elders. So I did not get to see the entire valley since we have to go catch the last bus back to the main town. Like Daisy Beth, I already miss Buguias. I plan to be back. This entry was posted in Diaspora Donors, Diaspora Giving, Overseas workers, Philippines and tagged Benguet, diaspora, giving, missing home, Philippines, Tel Aviv. Bookmark the permalink. So you and Myrla and others (maybe me in the future) can establish relationships with the mountain people and learn that we are One People, and your framework is One World. Blessings on your efforts and may the Jan. 22 Summit be a powerful force for cooperation, collaboration or Bayanihan. I’m deep in Get out the Vote anxieties for Feb. 22 mayoral election. Pres. Clinton came Tues. for Rahm. And he is not responding to the Asian American forum invite for Feb. 8th. He seems quite arrogant. Thank you for your comments and for continuing to read my blog. Thank you also for your continued support! what do you mean by mountain people, they are but educated not unlike what we see without clothes..now the means of transportation not but taxi to travel to the city..Proud of my father land..cause I came from that place Buguias, Benguet. You must be proud to be from this beautiful town, Buguias. I was so privileged to visit your hometown in 2011. Thank you for reading my blog. Wow! thanks for visiting my hometown, and appreciating it, it’s one of a kind effort. Kudos, and we are hoping we will be able to raise enough funds for the elders who needs medical equipments. Keep it up the good work and we hope for the best for the upcoming projects. I’m honored that you introduced me to your father and shared with me your beautiful hometown. I hope I could be part of fulfilling your dream in helping the elders there and the whole community of Buguias. Together we all could make a difference. Maraming salamat! I’m so lucky to be invited to visit Buguias; it’s such a beautiful valley. I plan to go straight there on my next visit to the Philippines. i too am from the very place of LOO. i feel so happy that someone out there is so much caring enough for the people of buguias as a town. thanks for appreciating the beauty of our mountains and valley. keep on, sir. I was truly fascinated by the beauty of your hometown, the Loo Valley; it’s one of the undiscovered destinations in the Philippines. Thank you and please keep reading my blog! Maraming salamat! I am quite happy to read your blog about my hometown, Buguias. Thank you for all you do to help our elders. My lolo still lives in Loo, it is a good reminder to visit this Holy Week. Thank you! I was privileged to visit your beautiful hometown, a gem of a valley hidden by the mountains. Thank you for reading my blog! Salamat.